Hockey icons and fans described late Toronto Maple Leafs goaltender Johnny Bower as a tough competitor on the ice and a humble man off it at a special memorial service Wednesday afternoon. Thousands were in the stands at the Air Canada Centre to pay tribute to the man many regard as the face of the Leafs. A roster of hockey legends, including Bower's former teammates Ron Ellis, Dave Keon and Frank Mahovlich, shared the stage with longtime Leafs broadcaster Joe Bowen, who served as the master of ceremonies. "Number one in your program for every game he ever played; Johnny will remain number one in the hearts of generations of Leafs fans forever," said Bowen in the Leafs' tribute video. Bowen, who has been the Leafs' play-by-play man for 36 years, told the crowd that Bower was much more than his favourite player. 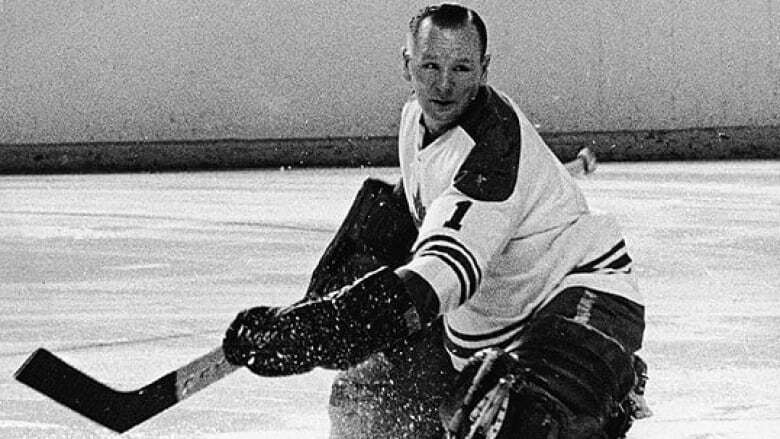 "Johnny Bower was my hero, he was my idol, and later in life, my mentor — and most of all my friend," he explained. The pair first met in the locker room at Maple Leaf Gardens in the mid-1960s, a place where Bower became a legend to Toronto fans and the hockey community at large. The Leafs had just clinched a victory over the Chicago Blackhawks and Bowen recalled he was "as red-faced as a goal light" when he shook Bower's hand. 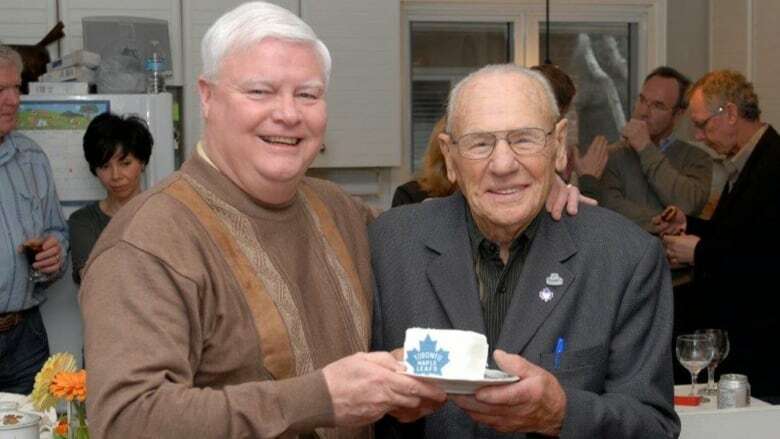 "I put Johnny Bower on a hero's pedestal that no mortal could have really lived up to," he said, adding that when they finally met again years later, this time when Bowen was a commentator, he realized it wasn't high enough. "He is a treasure for this entire nation — not just Toronto and Ontario and the Toronto Maple Leafs," Bowen told CBC News ahead of the celebration. "[He] was easily the nicest, most generous, most humble man I have ever met." Bowen, now the voice of the Leafs on radio, went on to describe his friend as a "very special individual, a very special human and a very special athlete," whose impact on the sport transcended generations of fans. "He touched everybody," he told CBC News. "He was out in so many social activities, making appearances and fundraising that there weren't an awful lot of people that were in Toronto that didn't get touched by this individual at some point in time in his 93 years." Bower, a Hockey Hall of Fame inductee and Canadian Second World War veteran, died on Dec. 26 after a short battle with pneumonia. He was 93. 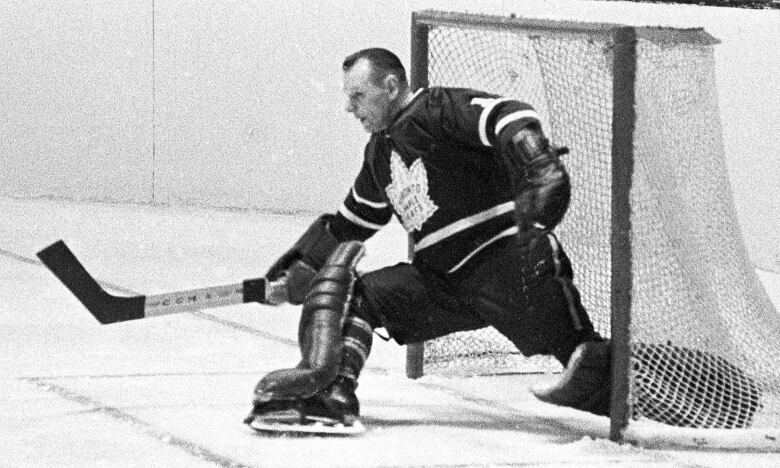 The two-time Vezina Trophy winner as the NHL's top goaltender toiled in the American Hockey League for 13 seasons before earning a permanent spot in 1958 with the Leafs. He was 34 when he stood in their net for the first time, an age when many players would be considering retirement. At the time, the last place Leafs claimed him hoping he could shore up a weak team while they developed younger players who would eventually form the core of a championship squad. "His road to the Maple Leafs and the four Cups was much bumpier, harder and longer than many of us, and yet he became the centrepiece of our team" Keon told the crowd at the Air Canada Centre. Bower played in 552 regular season NHL games in an era when goaltenders didn't wear masks. Fear was part of goaltending back then, Bowen reflected, adding it was "absolutely numbing" to think what could happen to a player's head. "Johnny didn't care. We have a video of him throwing his face in front of a shot to make sure it didn't go in," said Bowen. "That kind of courage, I don't know if you could find that anywhere." Bower, who was self-taught, playing in pickup games on ponds in Saskatchewan using a crooked tree branch as a stick and old mattresses as makeshift goalie pads, had his name engraved on the Stanley Cup four times before he retired at 45. He was a member of the Leafs' last Stanley Cup team in 1967. "The competition was always really really good," said former Montreal Canadien Yvan Cournoyer, as he painted a picture of the heated rivalry between the Leafs and Habs on the ice. Cournoyer, who played right wing, says Bower's saves are what he remembers most from when the two teams faced off in the 60s. "I was 20 years old my first year and Toe Blake sent me for a penalty shot and he stopped me. After that, that day was always in my head," he said. "I'm going to miss him a lot." 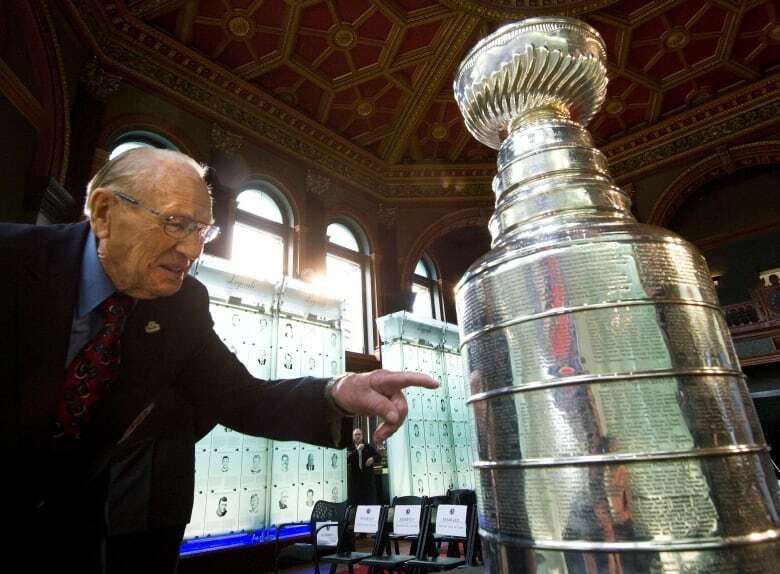 Bower's grandson, Johnny Bower III, and Leafs president Brendan Shanahan also spoke about the legendary goalie and his place in the team's history. "I've seen videos recently of him helping a Montreal Canadien who had crashed into his net get untangled. I've seen even Gordie Howe put his arm around him after just losing the Stanley Cup to Johnny Bower and the Toronto Maple Leafs," said Shanahan who noted that's what makes him one of the most revered players in franchise history. Former Leafs captain Darryl Sittler attended the celebration, saying Bower was his mentor and his dad's favourite player. "His name was in our home for many many years before he even got to the Maple Leafs," he said. The pair met at a Leafs training camp in 1970, a year after Bower retired, when Sittler was a rookie. "Johnny would treat everybody the same. He never took anything for granted and always appreciated being a Maple Leaf," Sittler reflected. "I think parents tell their kids, 'You watch a guy like him and you can learn a lot from him.'" "I don't think he understood just what type of impact he had on his community," Bower III told CBC Radio's Metro Morning on Wednesday. Upon retirement from the ice, Bower continued to work for the club as a scout until he was 65. He finally stepped away in 1990, ending a 32-year run with the team. But that didn't stop his commitment to the game, Bower III said. 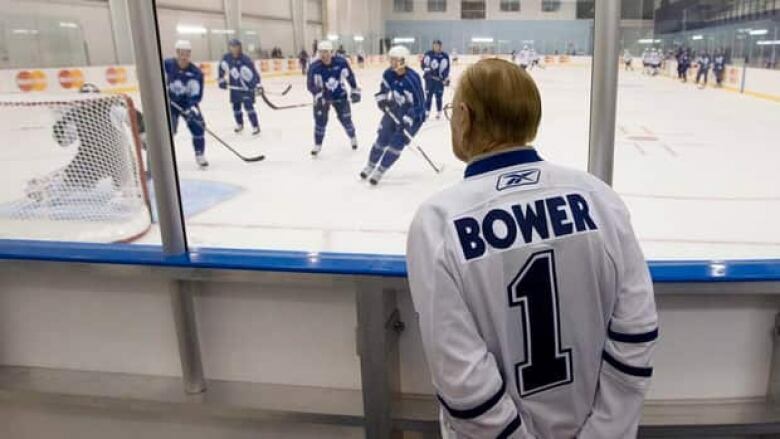 Bower became the Leafs' first unofficial goodwill ambassador. "What people remember the most is not necessarily his playing days, he retired 50 years ago," Bower III said. "What people are remembering is the fact he was involved in the community, that he was always there with a warm smile, a hug, a handshake and willing to talk with somebody who just wanted to stop him on the street to say hi in a grocery store and to get an autograph." 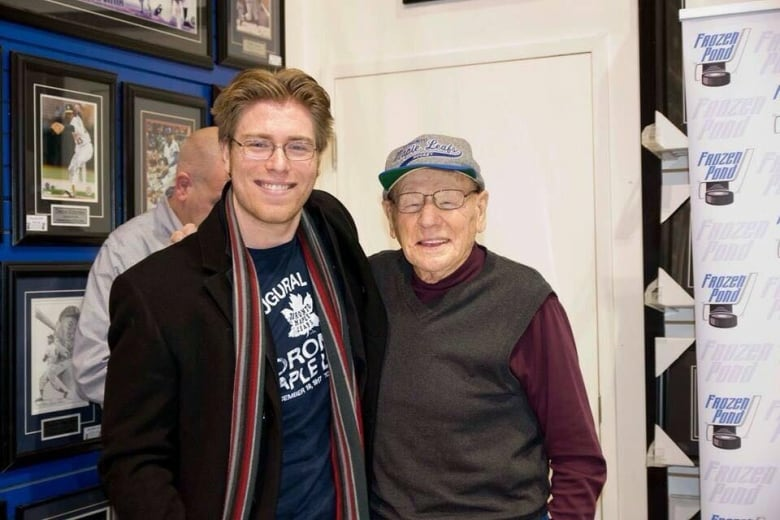 Leafs fan Aaron Spink remembers meeting Bower in 2013 and having his No.1 jersey signed. He told CBC News "it was a big honour" because he was a goaltender too. "That's what was so humbling about him as a person, he had time for everybody," he said. "There was just something special about the way that he thought of everything as special." As a family, Bower III says, they're most proud of what the former goaltender did after his playing days. "My grandfather inspired a lot of people ... because of what he was doing," he said. "He felt that it was a privilege being a Toronto Maple Leaf and he felt that he had a responsibility back to the community."